Gavi is a full bodied Italian white made from the Cortese grape. this grape has been around for some time, it’s roots can be traced back to the 1600s. It is produced in the vineyards surrounding the town of Gavi in the Piedmont region. It was given DOC status in 1974 and production more than tripled in the next 25 years. What makes this grape unusual is where it’s grown. Piedmont is red wine country, home to big Barolos, Barbaresco, Gattinara, Dolcetto and Barbera. And yet, the region boasts two of today’s most popular white wines, Gavi and Moscato d’Asti. Gavi’s aromatics are floral with a bit of lemon and apple. The fruity flavors are crisp green apple and melon with mineral notes and tangy citrus finish. It’s best served chilled with a broiled red snapper with an orange-fennel garnish or fillet of sole with sautéed zucchini and almonds. Last fall Brynn put us up on the auction block for a fundraiser for her sorority. It was to raise money for a scholarship and we have this unique and sought after talent: cooking, wine pairing and cleaning up. We quickly decided on an Italian theme since it is so popular and there are so many Italian wines to choose from. Our goal was to wow them with dinner, and introduce them to some unique Italian wines. The evening began with a classic antipasti called Bagna Cauda which literally translates to “hot bath.” The bath is made of garlic and anchovies steeped in olive oil. This is served with little chunks of asparagus, carrots, cauliflower, peppers, cherry tomatoes, mozzarella, and Pugliese bread. The diner dips the vegetables into the hot oil while using the bread to catch any drips, and then mangia, mangia! Two wines were served with this dish: a white, Italo Cescon Pinot Grigio from Veneto ($13) and a rosso, Pico Maccario Barbera d’Asti ($14). The Pinot Grigio from the Venice area was crisp, floral with good weight. The Barbera was perfect, lots of fruit with a hint of herbs and very good acidity. The acidity is typical of this grape variety and a perfect foil to the olive oil. The pasta course was cheese ravioli in brown butter with sautéed mushrooms and toasted garlic. The wine, Villa Caffagio Chianti Classico 2009 was so smooth, with depth and great flavors of cherries and herbs. It was well balanced and had a wonderful silky finish. It can be had for around $19. Brodetto, or the soup course, was a spicy potato kale served with a Tuscan red. We chose the Tuscan red to be served after the Chianti Classico because we wanted to show the Sangiovese grape from the same area in a different way. sourced from vineyards outside Chianti; or there are additions of fruit to the blend that are not allowed. For the main entrée, Chicken Saltimbocca in Marsala flanked by roasted acorn squash, sage-scented cannellini and Chard, we served two wines: Montresor Valpolicella 2009 and Catina Zaccagnini Montepulciano d’Abruzzo 2010. Valpolicella is a blend of grapes, Corvina, Rodinella and Molinara from the wine regions surrounding Venice. 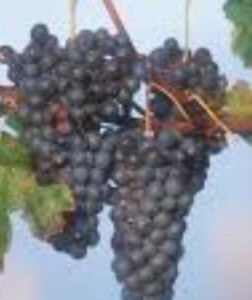 The Montepulciano is the grape from the Abruzzi area which is located at the calf on the Italian boot. Both are rich and fruity in their own way and sell for around $12 each. Dolce was a Lemon Ricotta Cheesecake which was wonderfully matched to the Risata Moscato d’Asti 2012 ($13). Moscato d’Asti is the Muscat grape, one of only two white grapes grown in the Piedmonte region of NW Italy. In this case, the wine is slightly fizzy or frizzante as the Italians call it. It was a match made in heaven. Umbria is fairly unique in that it is one of two landlocked regions in Italy. The other 18 regions all border on the sea. But in landlocked Umbria just southeast of Tuscany, La Carraia was founded in 1976 by two families. One of the founders was an Italian marketing and production entrepreneur. Before long, La Carraia began producing bulk wines for a couple of top estates, Ruffino and Rocca delle Macie. Today the winery owns almost 200 hundred acres near the heart of the Orvieto Classico region which is planted to the allowed grapes of Grechetto, Trebbiano, Verdelllo, Drupeggio and Malvasia. This Sangiovese is a brilliant ruby red color fermented in stainless steel with a lot of punch downs, then aged in oak for 3 months. It has loads of juicy plum and berry fruits on the nose. The plush fruit carries through on the palate with blackberry, plum and hints of herbs and spicy oak. Full bodied with crisp acidity and smooth tannins. This wine is a bargain at just under $9. that’s Amore! from Dean Martin’s song, That’s Amore! The grand Amore day is just around the corner, and here are a few wine ideas to help you get organized. It’s an Italian theme for a romantic dinner either homemade or an evening out. One of the loveliest of Italian grapes is Sangiovese. This darkly colored grape gets its name from the Latin, sanguis Jovis or blood of Jove. Jove being the king of gods until Christianity came along. Italy’s love affair with Sangiovese is proven by the fact that it is the most widely planted red grape variety in Italy. In the romantic Tuscan region, Sangiovese is the grape or the base of some great wines from Brunello di Montalcino, Vino Nobile di Montepulciano, Chianti to Morellino di Scansano. Ever wondered about the makeup of a Super Tuscan? Generally, these upscale wines from Tuscany allow blending Sangiovese with Cabernet Sauvignon, Cabernet Franc, Merlot and Syrah. These tend to be expensive ($$$) and long lived. Other Italian wine regions planted to Sangiovese and very affordable are Lazio, Umbria, Marche and the Island of Corsica. Outside of Italy, Sangiovese has put down roots in California, Washington and Australia where its naturally high acidity is an asset in those hot climates. Sangiovese is a thin-skinned, slow ripener. So slow in fact, some vineyards aren’t ready for harvesting until well into October. This extended growing season makes for richer, more concentrated aromas and flavors. The characteristic Sangiovese flavors are dark cherry and black stone fruit framed with savory notes of tomato leaf and dried herbs. There are many clones, the most prevalent Sangisovese Grosso, is known for its high acidity, sweet and savory flavors and mild tannins. Brunello di Montalcino is Tuscany’s most famous wine. Brunello from the Sangiovese Grosso clone, is from around the hilltop town of Montalcino where the vineyards radiate down the hillsides from the town. Although it is not release until it is five years old, Brunello is, with more age, fantastically aromatic, smooth with dark fruits and hints of savory herbs. It’s the perfect marriage with Osso Buco, a traditional Italian dish. This slow and delicious dish of braised veal shanks would surely melt anyone’s heart. The absolute best Brunello is from Vasco Sassetti. Others to look for would be Biondi Santi, Frescobaldi or Banfi. Brunello di Montalcino averages around $50 to 75. 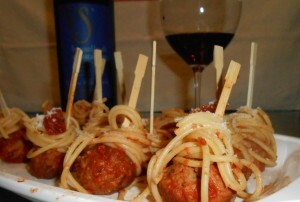 That would be my dream dinner for Valentine’s Day so here’s another ideal scenario: Spaghetti and Meatballs. Picture two Dalmatians at a checkered tablecloth out the backdoor of an Italian restaurant sucking down the same noodle. It’s a classic scene and an entrée best served with a bottle of Chianti Classico. The traditional Chianti blend was 75 to 90% Sangiovese with a bit of Canaiolo (10 to 30%) and 10 to 30% Trebbiano and/ or Malvasia. Today, a new law has reduced Canaiolo to 10% and permits up to 10 % non-traditional grapes such as Cabernet and Merlot. 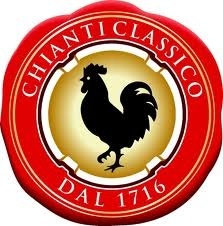 Chianti Classico is situated between Florence and Siena, the inner zone within Tuscany’s Chianti district. Isole y Olena, Gabbiano, and Ruffino are all likely candidates for the seductively simple spaghetti and meatballs with a lovely price point right around $15. And for that sweet ending to a luscious meal, Ann Vogel’s recipe for Tiramisu must be accompanied by Vin Santo. It’s a style of Tuscan dessert wine made from dried Malvasia or Trebbiano grapes. The best way to describe it – it’s like the kiss of an angel. Brunello di Montalcino is an Italian red wine produced around the town of Montalcino in Tuscany. In 1980, Brunello di Montalcino was designated as a Denominazione di Origine Controllata e Garantita (DOCG). It is one of Italy’s more expensive wines. Brunello di Montalcino is made from 100 percent Sangiovese. When it comes time to ferment, Brunellos have an extended maceration period. This allows for more color and flavor to be extracted from the skins. After fermentation the wine is aged for three or more years in neutral Slavonian oak casks. Most producers then separate the normale and riserva bottlings at this point. The normale bottles are released four years after harvest and the riserva six years after harvest.